An adventurous expedition in the valley of Uldale requiring plenty of scrambling to visit a host of waterfalls, including Uldale Force. This was the first of two walks I did in the same day in the Rawthey valley either side of a lunch date with some friends in Sedbergh. The aim of both this route and the one in the afternoon in the gills above Hebblethwaite Hall was to try and find some of the many waterfalls in the region. From the parking area just south of Rawthey Bridge I crossed the road and went through a gate to access an old track, once an old road from Rawthey Bridge to Bluecaster Side. Climbing up the slopes of Bluecaster I turned left at a junction to take a thinner path heading east above Uldale. While sunny it was also a very hazy day which did somewhat spoil the views up the valley. However, I hadn’t come for the long distance views, what I was interested in was waterfalls and I wasn’t disappointed. The first cascades I came across were about a mile and a half into the walk as the path dropped down to the footbridge just beyond Needlehouse Gill. Immediately upstream of the footbridge were a series of small waterfalls caused by a succession of rocky ledges. The rest of the walk upstream was quite an adventure as I scrambled up and down steep banks, forded the Rawthey countless times and even climbed up the side of two of the waterfalls in order to make progress. It should be emphasised that this was only necessary so I could get close up to some of the waterfalls. The path itself continued upstream without any difficulties. After passing the former Rawthey Gill Quarry I realised the path was going to climb quite high up the side of the gill so instead I scrambled down, crossed the river near one waterfall and carried on up the north bank where I climbed up alongside a small waterfall to reach the main attraction of the walk – Uldale Force. Imposing in height and at the head of its own steep sided gorge Uldale Force is an impressive sight and deserves to be much better known. 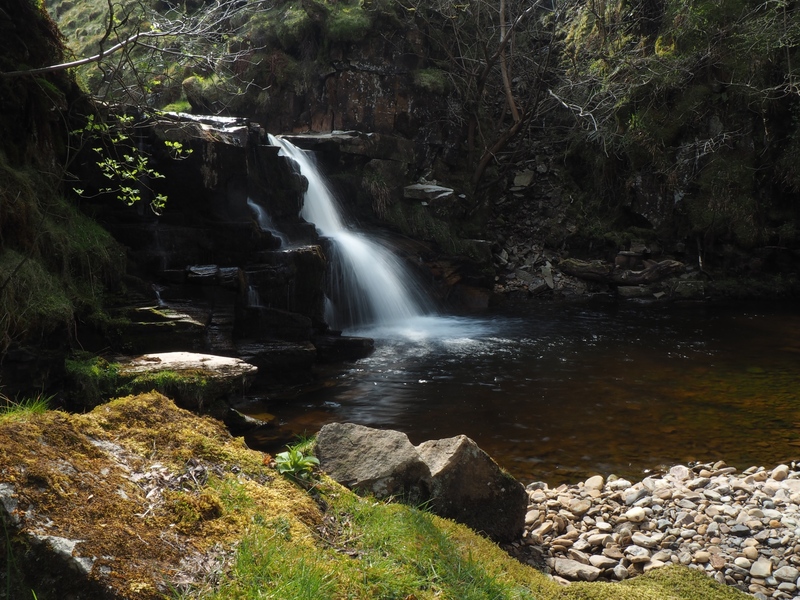 It was certainly the effort to reach, indeed the various obstacles I’d overcome as I made my way upstream made my arrival at Uldale Force all the more satisfying. I felt I’d really earned the privilege of seeing it. After taking numerous pictures I looked for an escape route and spotted it in a steep grassy rake climbing nort-west out of the gill. While it looked eminently doable from below I won’t pretend that there wasn’t a couple of occasions as I looked back down that I felt it wasn’t such a good idea. I did however make it out safely and after the gradient began to ease I came to a broken wall and two barbed wire fences. Climbing carefully over these I joined the Uldale – Grisedale footpath. Turning left on this I could enjoy much easier walking as I crossed first Whin Stone Gill Bridge and Blea Gill Bridge. At Needlehouse Gill I left the main track to drop down through the woods before crossing the stream at a small footbridge. From there I commenced the final, easy leg of the walk via Needle House, New House and Tarn. Finally I descended the minor road to Uldale House back to Rawthey Bridge. In its own way this was as adventurous a walk as any I’ve done in the Yorkshire Dales. The River Rawthey in Uldale is a succession of delights but to see them all does require steady nerves in places. So, not for the faint hearted, but for anyone else highly recommended.